Tonight I attended our block club's ice cream social. If you remember, last fall I skipped the pot luck picnic for whatever reason and hung out like a fugitive in my darkened house. I think it's just making myself walk over there that is the problem. Silly, I know. I can be pretty shy, but once in a crowd I'm kind of a chatty soul. I always have fun. And, yes, everyone heard the concrete guys' jackhammer at 7am when they were putting in my front step. So, I issued an offical apology. I actually ended up staying at the "social" for 2 hours. It's a big city, so I figure it's always nice to meet a few more friendly faces. I have aluminum storm windows on many of the windows of my house. I curse them every time I have to look at them. I double curse them every time I have to open one. They jump easily off track and the metal sliding on metal is a feeling similar to fingernails on a blackboard. Eeek! But, they are here to stay until I figure out what I want to replace them with.....and then save the money to purchase/create said replacement. I'm not sure why it took me so long to figure this out, but all of a sudden it dawned on me that a little spritz of WD40 down each of the side channels might help. What difference that makes! The storms still look hideous, but now they slide up and down without problem. Are you looking for ways to get out this summer and enjoy the fresh air and sun? Want to learn more about local architecture & history? I ran across this long list of free walking tours put on by the Minneapolis Heritage Preservation Commission. No reservations needed, just appear at the designated starting point 15 minutes before the tour. I'd love to take the tour of Milwaukee Avenue....or Linden Hills (my old neighborhood)....or Tangle Town......or Meeker Lock & Dam....Grain Belt Brewery. Actually, they all sound pretty darn interesting! 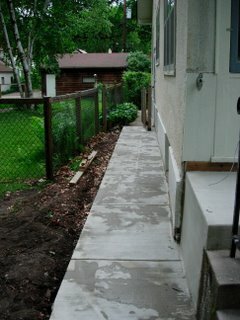 I've included a few more random shots of the concrete step & sidewalk I had added last week. 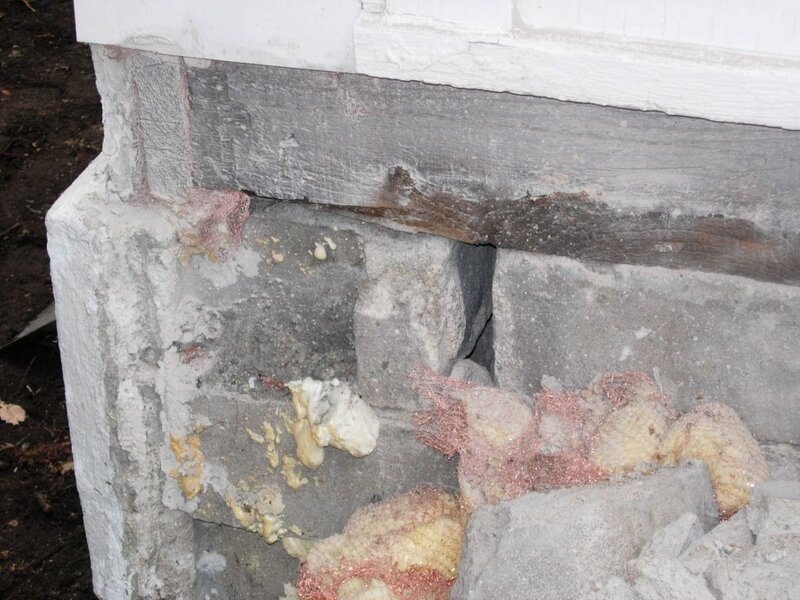 The first shot is proof positive of the mouse hole that started this whole project rolling. It actually turned out to be a gap between two concrete foundation blocks, as well as cracks around the threshold board. 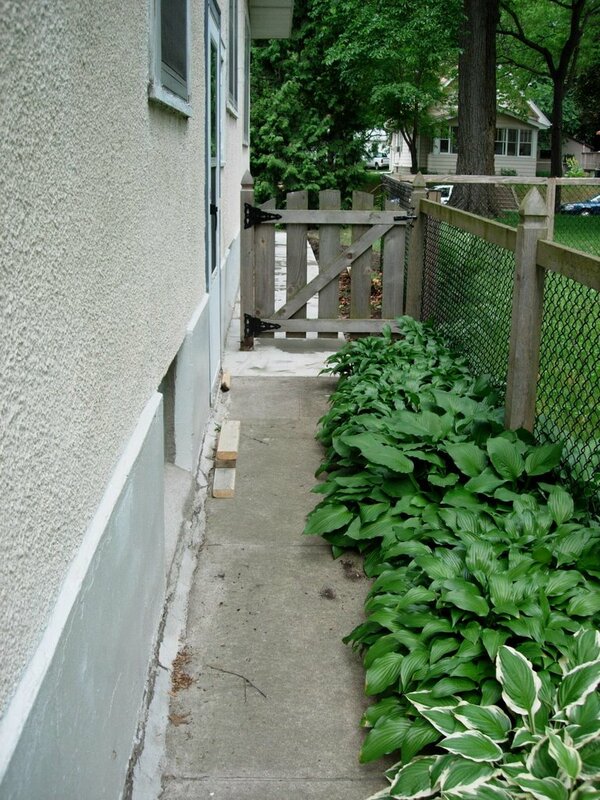 We stuffed it shut with copper enclosed insulation before pouring the new step that covered it in it's entirety. Last Sat. morning, I'm thinking at least one mouse made a rather unpleasant discovery about their living situation (R.I.P.). Then we have a photo taken after the awful old wood chip & pressure treated wood pathway had been cleared and the mold & rebar laid for the new sidewalk. 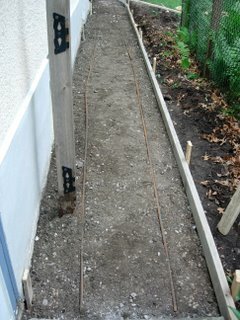 For some reason, I forgot to take a photo of the side of the house before the woodchips were removed. But trust me on this, it was bad....really, really bad. 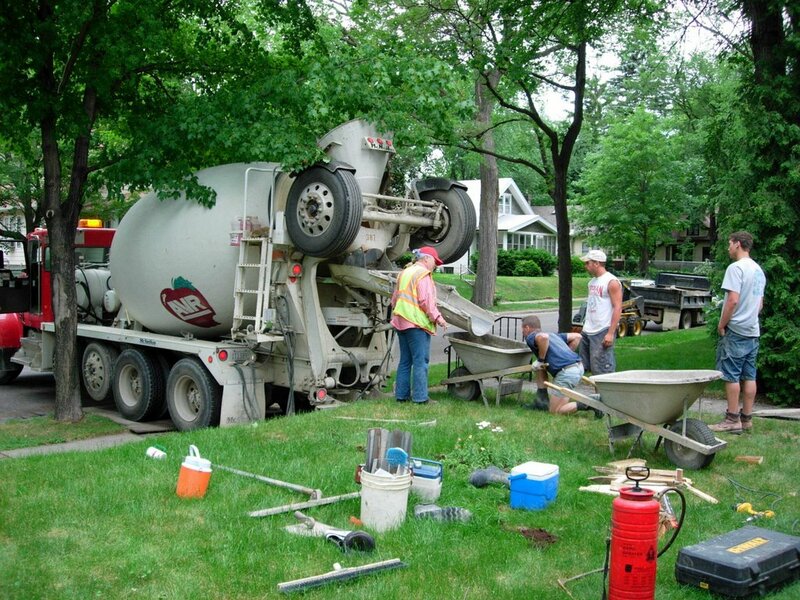 The arrival of the concrete truck was oh-so-exciting. I had to try hard not to act giddy in front of the crew. I was somewhat fascinated by the lady driving the truck. She was able to back that thing up onto my lawn, get the downspout operational and joke with the guys all while a cigarette dangled from her lip. An acquired talent, I'm sure. These guys worked hard. They arrived at my house at 6:30 am and were entirely done by 1:30. If they took a break, I didn't see it. 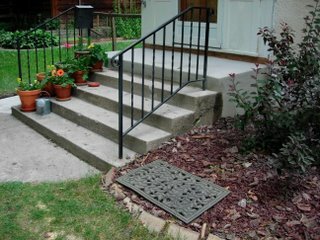 The photo of the old steps & the newly poured concrete shows just how dirty the step and the foundation are from the wood chip path and sitting water. I'll need to give the side of the steps & the once-white foundation a good scrubbing. This is probably the view where the new concrete is most obvious. I'm thinking of planting hostas on side of the sidewalk and this would mask this view. The new stuff should start to patina pretty soon. The guys put a sheet of plastic tightly over the fresh concrete to help it cure. 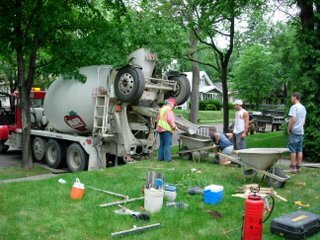 It was a fairly cold day here and pretty muggy, which turned out to be ideal weather for pouring concrete....as the slower it dries the stronger it gets. Thunderstorms were scheduled for the afternoon, so there was some worry that my new sidewalk would end up with dents in it. I was fully prepared to go out in any thunderstorm and lay across my new sidewalk to prevent it from becoming blemished in any way :-) But, as luck would have it we had a few sprinkles and that was it. You can still see some of the water spots on the sidewalk after I removed the plastic. I left the pastic on (per the contractor's instructions until the next afternon, but my structural engineer dad told me I could have let it on even for a few more days to help in the curing process). Finally (I had a few others, but Blogger won't let me add more photos to this entry), is a shot from the backyard forward. The gate marks the spot where the new sidewalk starts. It is nice to actually be able to reach the back door without walking through a jungle of ferns, possible mice & spiders and creepy woodchips, oh my! I toyed with the idea of writing my name....or the date....or something else clever into the wet step, but just couldn't bring myself to do it. It looked so pristine. I was browsing through the MLS realty listing (I do it periodically to keep up on property prices) and spotted an address that looked familiar. It was that of the first non-college apartment that I lived in. The building has turned condo and a few remaining units are listed. For those from the Twin Cities, this building was one of the original 1920's apartment buildings directly on the west shores of Lake Harriet. 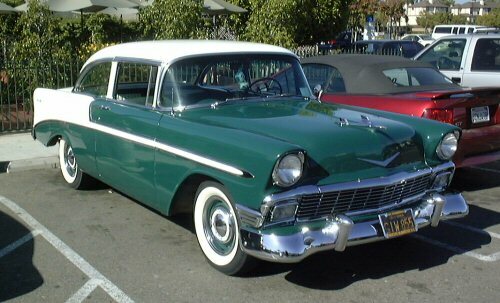 It stood across the street from the trolly stand and the band shelter. On a summer's day I could open the windows to my apartment and hear the concerts going on at the lake. We used to sit out on the front porch and grill and people watch. I rollerbladed & biked daily around the lake....in the winter we skated at the lake rink across the street. My friends just about killed me when I decided to move. I think my actual unit is listed (no photos). It says the studio was 475 sq ft. There are photos of the first floor unit's original kitchen, wood floors, & dressing room very similar, but a bit smaller than mine. The studios originally had a Murphy bed that swung down out of the dressing room and into the living room. My unit was original with the exception of the stove that was replaced in the 1950's. It had an entryway, a tiny dining room, kitchen, livingroom/bedroom, walk in closet (I loved that) and rather large bathroom. There was also an original, freestanding armoir in the dressing room that held all of my clothes. Amazing all that fit into that tiny sq footage. Even more amazing that I could fit all of my stuff into that space and now feel crowded with 1400 sq ft. Yowsa, looks like "my" unit is selling for $190k which is high even for that area! Also of interest, if you are from this area are the condos that went into the old Sears Building off of Lake Street. I remember shopping in that store when I was little. They made fresh bread and popcorn at a little sand when you walked in the door off the parking lot. We always used to bring a loaf of that bread home. Nice to see the building being put back into use after sitting empty for so long. Have you noticed that the sun is shining brighter, the grass is greener and the birds are singing more sweetly? Or is that just me because I finally have a new front step?! 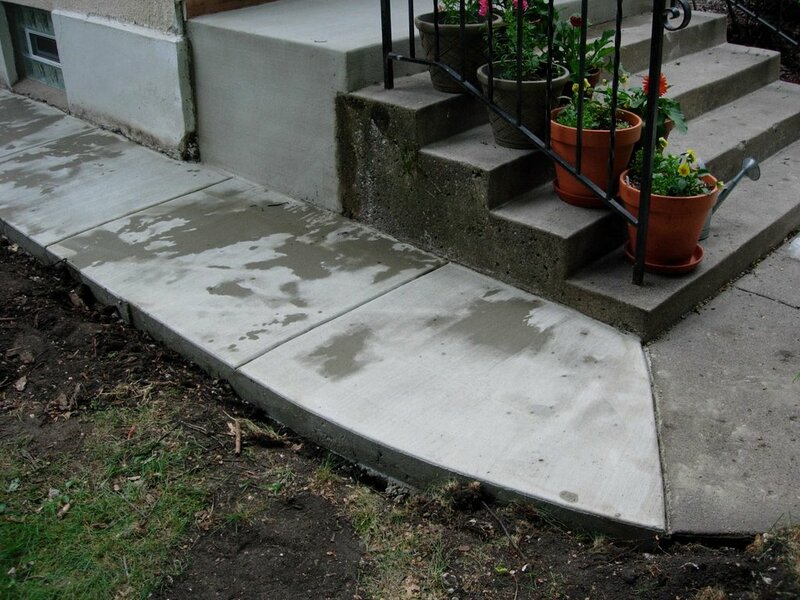 Daymar Construction finished pouring my new front step and sidewalk on Friday. (For clarification this is the second company that I called, not the first flaky contractor.) The curing plastic is now off, and I couldn't be happier. I've posted some photos of the finished product. From the street it is hardly noticable as only the top "stoop" was replaced. I'll post more of the details and in-progress photos in the next day or so. 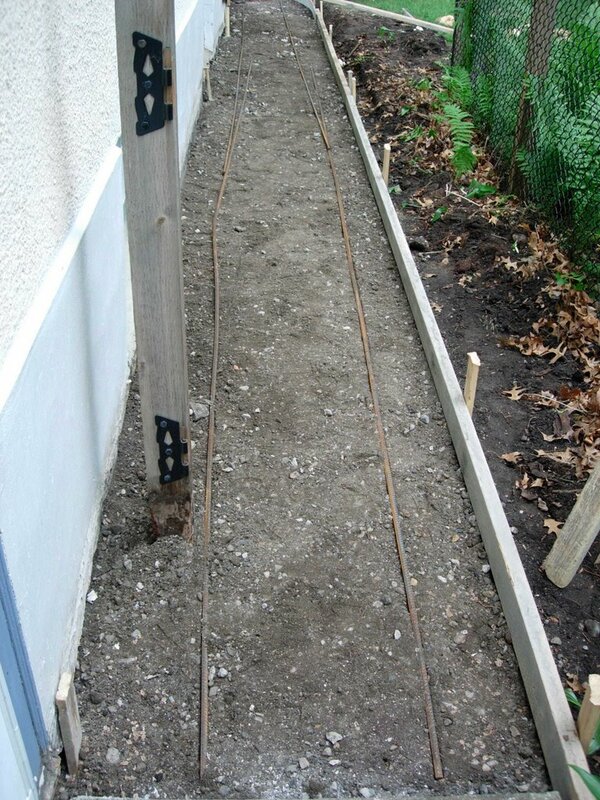 I'll also need to some input on handrails & planting along the side (I have a few ideas to run by you). What had me up at 5:30 this morning (I am not a morning person) and feeling as giddy as a kid before Santa arrives? The Concrete Guy is here! I didn't want to post anything before they actually knocked on my door ready to work, lest I jinx something. But they arrived promptly at 6:30 and started removing the old stuff. 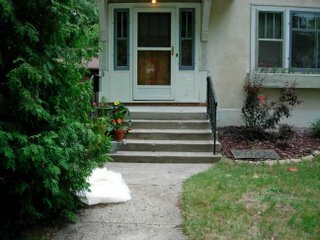 I'm hoping my neighbors will overlook the 7am jackhammer :-) They are replacing an old front step and adding a sidewalk to the side of my house where one had been removed and replaced with woodchips & ferns by the PO. I was up at midnight last night priming the ceder board that I will use between the threshold and the new step. I'm not sure what my problem was...it's not like I didn't have a month to make sure that was done. But, luckily it dried and is ready for them to install once they are done. I don't want to be too much of a geek out there with my camera photoing the progress, but I'll try to sneak out at lunchtime and take a few shots. I actually wish I could just pull up a lawn chair and watch them. It is more exciting than anything I have planned today (now that I type that it seems kind of sad, no?) But, I am that excited about this. I had to chuckle because they were concerned about killing the ferns growing on the side of my house. I think a PO planted them to absorb some of the water falling off the roof to prevent it from going into the basement. At any rate, they were waist high at this point. These ferns can not be killed. They cut them down to the ground this morning to work and I would bet money on the ferns reappearing next week. I think I might be rambling and desperately need to go get an iced latte to focus my tired brain. Of course, a follow up post will be coming shortly. Yeah, they are actually here! After purchasing my new sink(s), I have been spending some time tracking down a new faucet (if I don't decide to keep the original.....and depending on which sink I decide to use). Here's what I have discovered. The set is $1650 (gasp). It is part of a new line by Lefroy Brooks. 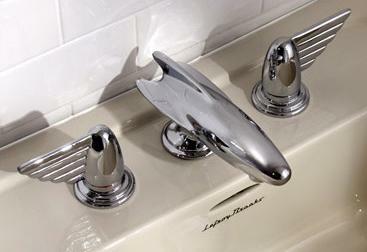 Word has it that the company also has a new line of pastel colored bathroom fixtures (sink, etc.) to complement the hardware. I assume this is what you see in their photo. Company phone: 718-302-5292.